Have you ever dreamed that you were squeezing yourself out of a giant toothpaste tube as the tube slowly tightened around your body? Something similar happens to lobsters,1,2 so it’s more of a living nightmare for them. Lobster molting would end in sudden death if God hadn’t provided a solution to their predicament of constantly outgrowing their shells. Lobster molting is a valuable display of God’s glory as our Creator, since God has carefully and cleverly bioengineered lobster molting so purposefully.3 Additionally, the process of molting, with its vulnerable shell-shedding phase called ecdysis, illustrates the implausibility of lobster life cycles somehow bumbling and stumbling into successful biomachinery programming through purposeless evolutionary accidents. Images credit: Penang Channel, posted on youtube.com. Used in accordance with federal copyright (fair use doctrine) law. Usage by ICR does not imply endorsement of copyright holder. 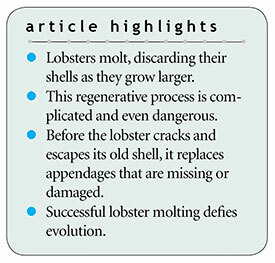 Consider the overall molting process, all of which must work successfully or the lobster quickly dies. The molting lobster must break his old shell before he can squeeze himself out. Once out, his body needs to pulse with quick “growth spurts” and then harden the new cuticle before he is gobbled up by a hungry codfish! To force this “do or die” breach, the lobster exerts inside pressure against a seam that joins the carapace to the shell segment below it. To prepare for shell rupturing, lobsters absorb extra water. The molting process accomplishes more than just accommodating new size requirements. Prior to ecdysis, the lobster replaces amputated limbs with ones fitted for the successor shell. These new limbs are activated when the old shell is shed. Only God could have designed lobster life cycles so that they work, repeatedly and successfully. Although minor details differ, the molting process for American lobsters (Homarus americanus), Norwegian lobsters (Nephrops norvegicus), and spiny lobsters (Panulirus polyphagus) is basically the same. See Bliss, D. E. 1990. Shrimps, Lobsters, and Crabs: Their Fascinating Life Story. New York: Columbia University Press, 180-193; quotes on pages 180, 182, and 186. 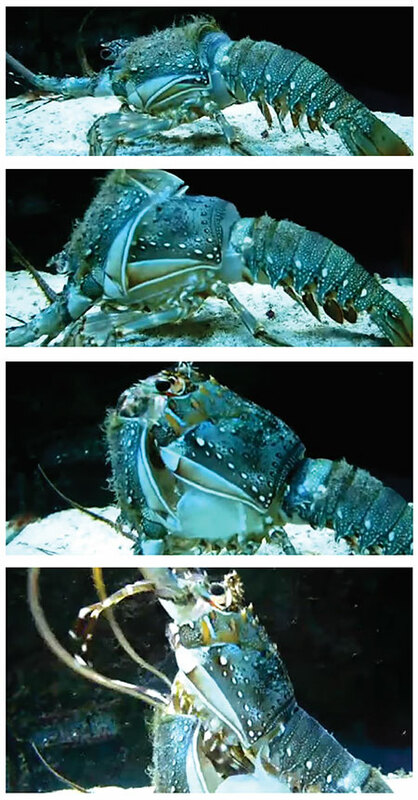 See Lobster removing his shell amazing video. Penang Channel. Posted on youtube.com January 22, 2013. Ayali, A. 2009 The role of the arthropod stomatogastric nervous system in moulting behaviour and ecdysis. Journal of Experimental Biology. 212: 453-459; quote on page 456. Showcasing Christ’s glory as Creator, as well as refuting evolutionary notions, will be prioritized in ICR’s future Discovery Center for Science and Earth History. See Johnson, J. J. S. 2017. Polar Bears, Fitted to Fill and Flourish. Acts & Facts. 46 (8): 21. Corson, T. 2005. The Secret Life of Lobsters: How Fishermen and Scientists Are Unraveling the Mysteries of Our Favorite Crustacean. New York: Harper Perennial, 62-63. Cite this article: James J. S. Johnson, J.D., Th.D. 2018. Lobsters Get Comfortable in Their New Skin. Acts & Facts. 47 (9).